Thank you for supporting your USA Shooting Team! USA Shooting has a proud tradition of excellence having earned 110 Olympic medals in our history. Moving forward in our 2020 Vision, our athletes are NOW the story. Collectively they represent everything that we love about the shooting sports. 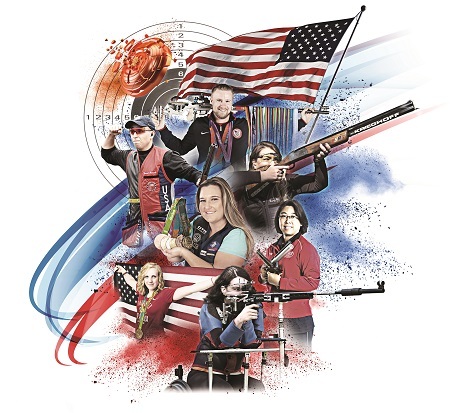 The USA Shooting Team carries on the proud tradition of medal-winning success and shooting skill unlike any other country in the world, exemplifying the greatest defense possible for protecting, preserving and promoting the shooting sports legacy of this country. Their story can’t be told enough as we cheer them on along their Road to Tokyo and beyond. USA Shooting raises funds to support athletes in America. From grassroots training to world-class competitions, we provide athletes the resources needed to pursue greatness and continue USA Shooting’s tradition of producing high-performance athletes capable of winning international, World Championship, and Olympic and Paralympic medals. Donating enables our athletes to achieve their dreams and the shooting community to unite in growing our sport. Follow us as we raise our flag on the world’s stage. Go Team USA! Please select how your gift should be designated. USA Shooting has partnered with RaiseDonors to assist in the processing of donations.